The very name of the band, Facegrinder, is an indicator that this band is not meant to be a casual soft listen intended for a setting with pleasant lighting. Rather, the name indicates that this is music that is meant to be a soundtrack for some violent and mad moshing. This quartet from Perth, Australia, delivers just that with their brand of Brutal Death Metal, with Grindcore leanings. ‘Unstable Mentality and Theoretical Convulsion’ is the bands first full length which comes after a split and an EP. This album is not something that has much to ponder over in terms of music. Describing the music, does not require much thinking from the listener’s part. The only aim of the music seems to be to strip the listener down to his most barbaric instincts, causing him to wreck anything and everything in his path. The above statement is not meant to be a negative point, because no one listening to a brutal death metal album comes in, expecting very intelligent and progressive music. The songs on this record are short and they are heavy. The guitar work is very slam oriented and combined with the support of the heavy bass, it wreaks havoc. Facegrinder is basically, three fourths Corpseflesh. All the members, with the exception of bassist Jason Collins, are a part of Corpseflesh’s lineup. Though this is the case, there is many a difference between the sounds of the two bands. 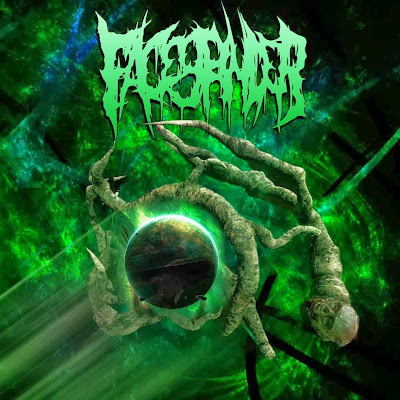 While Corpseflesh was more riff based music with a whimsical side, Facegrinder is a more serious death machine that has serious things to say. The use of samples is present, though they are not as funny as on the Corpseflesh record. This record makes the listener bang his head, whether he wants to or not. The vocals are the typical brutal death gutturals with some high pitched screams mixed in. The performance is tight and the delivery almost flawless. This album is not something that is going to go down in history as one of a kind. There have been similar albums before and I’m sure there will be more such albums in the future. Then why really should one give this album a chance? For one, this album contains some easily accessible brutal death metal / grindcore mix. Besides, for the entire 24 odd minutes that this album plays, it entertains. This is aggressive music that is guaranteed to give your neck a 24 minute workout. Tight performances and brilliant delivery make this album a worthy listen. But Facegrinder does have room for improvement.